Saint Michael’s College of Laguna is an autonomous higher education institution known for its long tradition of integrity and untarnished reputation, commitment to excellence and sustainability and viability of operations. Being an autonomous college, SMCL ranks as one of the top 6% higher educational institutions in the country. As a 21st century institution, it addressed the challenges of the current educational system and maintains a strategic position towards internationalization. It is committed to continual improvement and compliance of statutory and regulatory requirements in providing quality and relevant education to develop professionals, entrepreneurs and community leaders imbued with the values of service, moral uprightness, commitment to excellence and love for humanity. 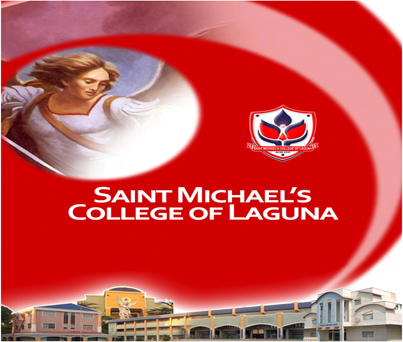 Saint Michael’s College of Laguna exists to educate and empower young people to make a difference to society. SMCL faculty and staff understand that learners need to be enabled, assisted, and empowered. At SMCL, students gain relevant experiences that are useful for life. On August 25, 1975, a brood of nine sisters from the Limaco family envisioned of providing quality education to the masses of Biñan, Laguna and its neighboring municipalities. To fulfill their vision, the Limaco sisters founded the Miguelunda Educational Corporation to run Saint Michael’s College of Laguna (SMCL), formerly known as Biñan College. Working under the inspiration of the philanthropic ideals of the Limaco patriarch, Miguel, after whom the Institution was named, Miguelunda Educational Corporation set out to establish a learning institution that provides quality education at reasonable costs and more importantly, addresses the demands of an education that is responsive and relevant to ever- evolving needs. As the years unraveled the College’s potential to bring out the best in the students that came under its care, Biñan College was renamed Saint Michael’s College of Laguna in 1983, reaffirming its serious and focused position in performing its mandate and corporate social responsibility. SMCL offers Pre-School, Middle School, Junior High School, Senior High School and College: Business Administration, Education, Liberal Arts, Computer Studies, Nursing and Hospitality Management. With its high scholastic standards, SMCL’s academic excellence has been acknowledged in the academic community. One of the foremost accrediting bodies of the country, the Philippine Association of Colleges and Universities Commission on Accreditation (PACUCOA), awarded SMCL with a Level III Reaccredited Status for its Liberal Arts, Business Administration and Education programs. Likewise, the Nursing, Grade School, and High School programs received Level II Reaccredited Status’ the Hospitality Management Program, Level II Accredited Status and the Computer Science Program Level I Accredited Status. The College was given the Gold Award by the PACUCOA for 100% of its programs accredited in 2015. It was also awarded Deregulated Status by the Commission on Higher Education in 2003 and has retained its status in 2009. SMCL has been awarded ISO 9001:2008 certification by TUV Rheinland is valid until September 14, 2018; proving its commitment to be globally comparable and competitive in its operations. Undoubtedly, Saint Michael’s College of Laguna will continue to mold minds, touch hearts, and transform lives. It will send forth to the world graduates imbued with the values of service, moral uprightness, commitment to excellence, and love for humanity and intercultural sensitivity.